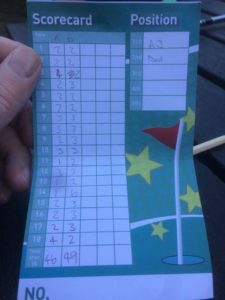 AJ and I used to regularly play mini golf, as you can see below up until about 1 year ago I used to give AJ 1 shot per hole at mini-golf. 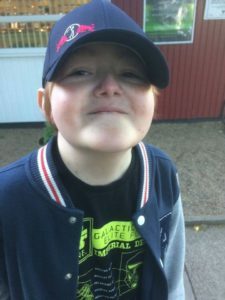 After he had the lung transplant in April AJ only got to play mini-golf once more before he died. 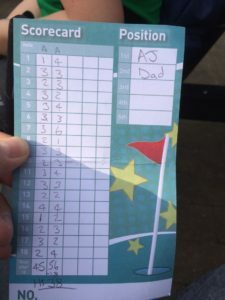 On this occasion I was winning after 9 holes and there was no handicap involved this time. On the back 9 holes AJ came roaring back, he had 3 hole in 1’s and I developed an inability to get the ball in the hole. By the end you can see that he genuinely beat me with no handicap involved by 3 shots. Im quite competitive but I am really pleased he got to have the satisfaction of beating his dad even if it was just once for the last time we got to play. Im not sure if ill ever play again but this will remain a happy memory. Also if you are wondering what the smug face of a winner looks like, see below!